I have a serious soft spot for scones. It steams from my mother who collected antique tea pots and tea cups. When I became a teenager we would go to high tea at the Four Seasons hotel in downtown Seattle. We would go all out, it wasn't jeans and t-shirts, I would dress in vintage Gunny Sack dresses (which are great if you have never worn one, love them!) and we would make a whole day of the event. Once I started working I decided to take my mom to Victoria, BC and to the Empress Hotel. She had read about their high tea for years and she was so excited. We had a great time and the weekend that we spent is one of my favorite memories. When my mother passed away my oldest was only nine days old and I was unable to go home. One of my aunts saved my mother's two favorite tea cups before they were scooped up by other family members and carefully shipped them across the country to my house. I am forever grateful to my aunt for this act. You can see the two tea cups on the corner of the photo. 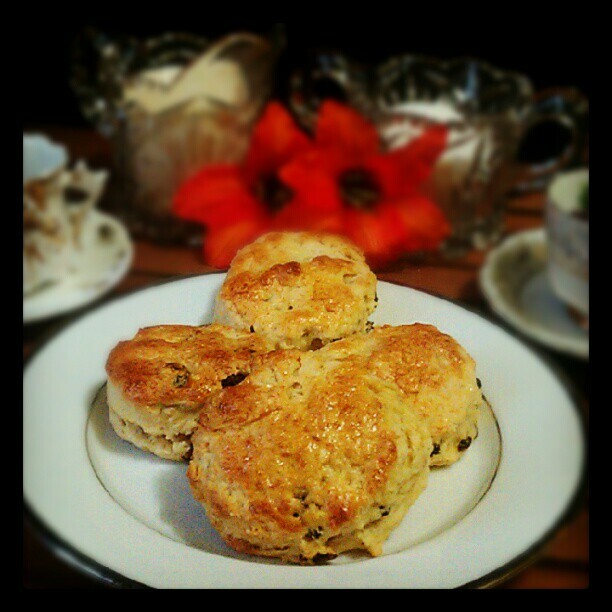 With all these memories tied to high tea and my mother scones are one of my greatest reminders of these times. Last week I tried a new recipe for Raisin Scones, which looked very simple and perfect for an afternoon tea at home with my two boys. This recipe has 8 ingredients. It takes 25 minutes of total time and makes 12 to 14 scones. I did make a few modifications. I have never used a pastry blender or two knives for my biscuits or scones. Instead I use my hands, making sure to only break the butter into pea size pieces and not to overly handle the dough. Over-handling the dough results in tough scones that stay flat when baked. When cutting out the scones make sure to twist the biscuit cutter. This twisting allows the edges to bake correctly in the oven. Avoid having to re-work the dough frequently; try to space the scones close to one another when cutting them out to avoid making the dough tough. To brush the top of the scones with the egg wash I use a silicon pastry brush. I love using silicon brushes, they are great for a variety of baked goods and make a beautiful finish on scones and bread. My two boys ate three of these scones as soon as they were out of the oven. They have a nice taste, without being overly sweet and are very simple. I would recommend eating these scones within a day of baking. Scones really are best when warm and go stale quickly. This is definitely a recipe I would make again! For the recipe go to Raisin Scones. Thanks :) Followed you back, come visit again soon! I'm sorry for the loss of your mother. The tea cups are beautiful and hearing their story makes them even more so. 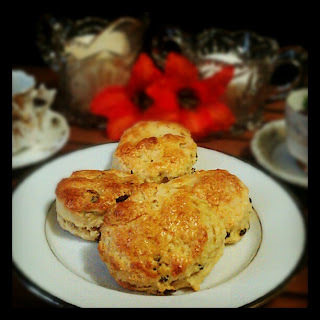 Thanks for the sweet comments :) I hope you like the scone recipe if you try it! My two boys loved them! Ooh! Those look sooo yummy! Thanks for hosting :) This really is a great recipe!